Imagine a liquid epoxy that is clear – A liquid epoxy with strength rivaling that of heavy duty paste epoxies – A liquid epoxy that has flexibility and is shatter resistant – A work time of 4 minutes and 1 hour cure time. Imagine no longer! PC-Clear™ Epoxy is a medium viscosity liquid epoxy system with greater clarity than other epoxies. This product is excellent for repairs and projects that must be less visible such as art objects or collectibles. PC-Clear™ epoxy is fast curing but allows ample time to apply and position the repair. After curing the epoxy does not become brittle, instead cured PC- Clear™ forms a tough resilient bond. PC-Clear™ can be used on more than just cosmetically critical repairs and in addition it can be used for automotive, construction and facility repairs. Use PC-Clear™ when you are concerned about appearance of your repair and a liquid epoxy is what you are looking for. Metals, glass, ceramics, tile, fabrics, wood, brick, block, rubber, concrete, stone, slate, fibreglass and more. Protect electronic components from vibration and moisture. Reattach multiple broken pieces in a vase. PC-CLEAR™ EPOXY | 1 oz. Roughly estimate how many ounces of PC-Clear™ are needed to fill a void. Divide the cubic inches by 2 to get the approximate number of ounces. 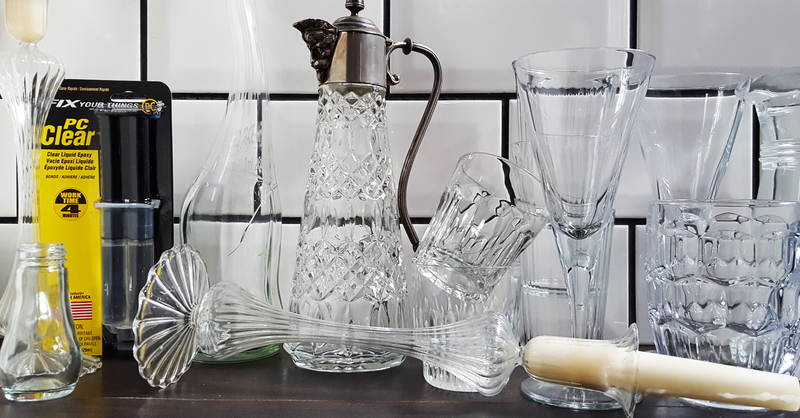 Remove contaminants such as dust, dirt, oil, barnacles and grime with a solvent such as Denatured Alcohol, Acetone, Rubbing Alcohol (isopropyl alcohol) or Lacquer Thinner. Mild detergent solution in water is also good removing contaminants. Use a clean paper towel or rag for wiping. Do not use Mineral Spirits or Paint Thinner for removing contaminants. Remove rust and loose paint with sandpaper or wire brush. Epoxy typically sticks to most paints. If there is a concern of the paint’s adhesion then remove it with sandpaper, wire brush or paint stripper. Clean up mixed epoxy before it cures with paper towels and solvent. Denatured Alcohol (ethanol), Acetone, Rubbing Alcohol (isopropyl alcohol) or Lacquer Thinner are suitable solvents for removing uncured epoxy. Cured epoxy can be removed with paint stripper or remover. Is PC-Clear™ Epoxy different from other clear epoxies? Some epoxies claim to be clear but they have a strong yellow tint that develops after it cures. PC-Clear™ Epoxy has a very slight hint of yellow that does not increase after curing. How does PC-Clear™ Epoxy’s strength compare to other epoxies? PC-Clear Epoxy™ is a strong adhesive with Lap Shear Adhesion strength on steel of 2500 psi. PC-Clear™ Epoxy is slightly flexible and more resilient than other liquid epoxies. How does outdoor exposure affect cured PC-Clear™? Ultra violet light will cause cured PC-Clear’s™ appearance to change and may cause yellowing. What is the best way to mix PC-Clear™? How you mix PC-Clear™ Epoxy will affect the length of working time. Flat surface mixing spreads the epoxy over an area minimizing the exotherm’s effect on the curing reaction and maximizing the length of work life. Mixing in a container concentrates the exotherm contributing to an increased rate of reaction and decreasing the work life. Why does PC-Clear™ Epoxy have a strong odour? The epoxy resin is nearly odourless. The hardener is the smelly part. It has an odour described as smelling like sewer gas or hair treatments. This odour comes from the polymercaptan but goes away upon curing. PC-Clear Epoxy™ is a liquid and is self-leveling. Can PC-Clear™ Epoxy be colored or tinted? PC-Clear™ Epoxy can be tinted. Can PC-Clear™ Epoxy 1 ounce dual syringe be used with a static mixer? Yes, but the static mixer has the same fitting as the PC-Autobond™. 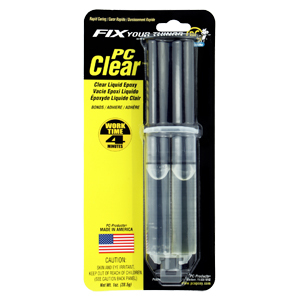 The PC-Clear™ Epoxy 1oz dual synringe is pre-measured and does not require measuring. Apply PC-Clear™ Epoxy with a spatula, tongue depressor, putty knife or brush when using the 1oz dual syringe.